As a place where you store supplies, your pantry is usually prone to clutter. And clutter is not the only one problem here. How many times do you find it hard to find your condiments? If it happens countless time, you need to organize your pantry better as soon as possible. The first thing that you can do to make your pantry look tidier is by investing in some containers to host several things in common. You don’t always have to buy the new containers. Shop around your house to find unused things that can be re-purposed like wooden soda crates. Wooden soda crates can be great organizers for your breads, cereals, and some bottles. The well-worn look of the crates infuses the timeless charm of rustic look. 9. Play with Colors and Patterns. Organizing your pantry is not only about keeping things tidy but also making it look appealing. You can arrange patterns and colors to make your pantry look mesmerizing. It doesn’t mean you can just throw as many colors as you like, though. This pantry features patterned wall that creates a great background. Some tints of yellow and white decorate open shelves, complementing the fridge and cabinets well. The spices on the wire racks lend more colors that can enrich this pantry. 8. Try Organizing Bottles and jars Using Trays. Sometimes placing sauce jars and the spice bottles on the shelf doesn’t seem right. It is like there is something missing. And they tend to be scattered a few inches apart, which make them look untidy and float. Try arranging them on a tray so they will be anchored in place. Round trays would be a nice choice as you can optimize the available space within the trays to store as many jars as possible. They will be bound together so they will not be scattered anymore. Do you often forget what you wanted to buy when you are at the supermarket? You’d better bring a small note a long with you. But, where will you jot down the supplies that are running out? These pantry doors really come in handy. When you are looking for a certain condiment and have just realized that you need restock it soon, you can jot it down on the chalkboard. Just don’t forget to keep the chalks within your reach. Another good thing about this pantry doors is they are DIY friendly. You do not need to replace the doors. You just need to paint the doors with chalkboard paint, and you’re done! If your kitchen is not big enough, you need to use some tricks to optimize the storage space. Even if you have to incorporate the pantry door in the storage space solution. There are many things that you can do to get an additional storage space on your door. One of them is by using an adjustable wire rack that you can get from Amazon or ebay. This rack comprises many small holes that can be used to hold the racks. And that’s the good part of it. The racks can be installed and removed easily so you can still have more space for taller bottles. Images in this point is provided by Amazon and it is used to promote a cool product named – ClosetMaid 1231 Adjustable 8-Tier Wall and Door Rack, 77-Inch Height X 12-Inch Wide. If you’re interested to get your kitchen this new idol, go and visit link I provided in sub heading or hyperlink below. On time I make this post, seller only sold it for $33.99. 5. Pull-Out Rack Next to The Fridge. Every nook and cranny count in a tiny kitchen like the one next to the fridge. It is usually too narrow for a shelf, but it is too big to be missed. Therefore, this cranny needs to be tapped into with this pull-out rack. To make this Rack, you’re gonna need plywood, casters, dowel rods, Flathead screws, wood screws, and some other tools and materials. First, you need to measure the open gap next to your fridge. It has to be precise. Then, make the frame and backing. After that, you can install the shelves after painting them. And finally, install the dowel rods and the handle bar. 4. Add More Storage Racks. You can’t just stack the supplies up if you have run out of space already. Stacking them up will create a messy look. Therefore, you need to incorporate additional storage space. If you are not really into DIY projects, you can get an under-cabinet storage shelf wire basket that helps you host cookies and bread. Another great option to tackle the limited space is the wire stack-able cabinet counter shelf. This wire shelf enables you to stack cans and bottles up without cramming them. By stacking them all, you’ll get a plenty of space. 3. Store The Lids Behind The Door. Lids of pans are quite tricky. They can’t be stacked. It means you can only lay them on the shelf, which gobbles up much space. To keep the lids tidy as well as saving more space, you can make some lid holders. They are easy to make. You just need to make a frame behind the door and install the square dowel rods that connect one side to the other. And, you can slip the lids there. The dowel rods will hold them in place, preventing them from falling down. 2. Make Use of Transparent Shoe Organizers. A great organizer can be anything, including transparent shoe organizers. These organizers feature some pockets that you can use to store the supplies used on a daily basis. Since it is transparent, you can see what is inside each pocket easily. 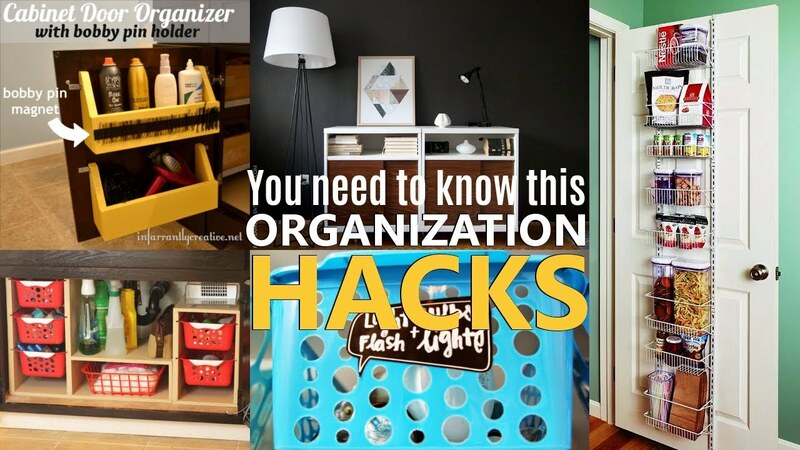 These organizers can be placed anywhere. However, the best spot is on the door because it is a piece of furniture that you see every day. Have you ever been trapped in your pantry with so many supplies for a long time to find flour? It means your pantry is such a haphazard storage space. If you have tidied it up, but you can’t still find what you want, maybe you just need to put on labels. It may sound trivial. But, trust me! Putting on labels can save a lot of time. You won’t be lost in your pantry anymore. This pantry looks great with white baskets and racks. All the storage organizers are white, which make them flow into one being. A label is attached on each of the baskets, allowing you to find the condiments you’re looking for in no time. So, Those are 10 clever pantry organization initiatives that will make your pantry look more well-organized and amazing. Do not forget to reorganize your pantry regularly to maintain the safe haven for supplies. Follow any hyperlinks available in this list and drown yourself to cool inspirations I have compiled for years.